Home / Newsroom / OpenScape Business reaches special milestone! In mid-December 2018, our partner dbr phoneconnect activated the 5,555,555th OpenScape Business user license at its customer godesys AG. “With this impressive success, OpenScape Business together with a strong partner distribution network underlines its leading market position”, explains Michael Trotz, Product Manager OpenScape Business, who presented the certificate to dbr phoneconnect during a small ceremony together with Lukas Giluk, UNIFY Partner Manager. 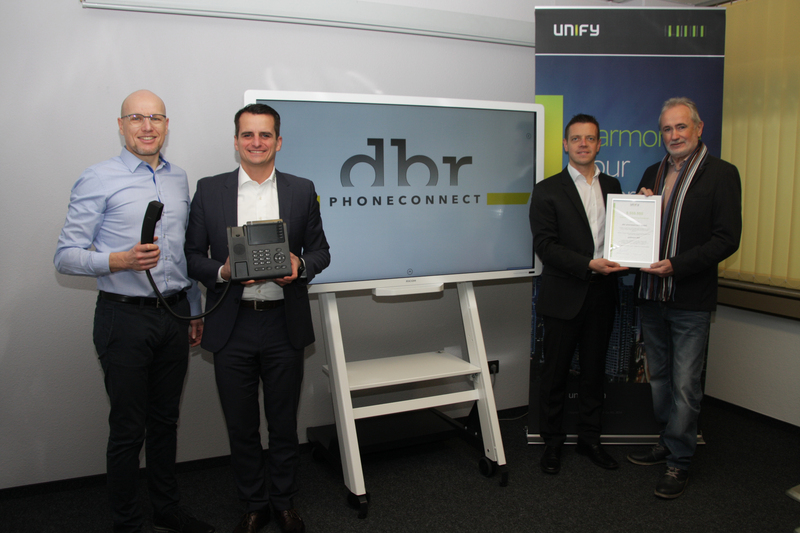 “For more than 20 years, we have been working in partnership with UNIFY and are very happy to use the solution with our customers because of its versatile application possibilities,” adds Reinhold Zeller from dbr phoneconnect. For more than two decades now, dbr phoneconnect has been offering small and medium-sized companies the entire spectrum of information, communication and network solutions. In close cooperation with the customer, dbr develops systems that exactly match the individual requirements of the customer. The customer, godesys AG, was looking for a new solution that could adapt flexibly to the company’s growth and communication needs. Mobility and accessibility across different locations were particularly important criteria. By integrating the communication system into the central IT environment, administrative and additional infrastructure costs as well as data center resources were to be saved. By means of a dynamic and intelligent call distribution, also across the different locations, the company wants to increase its accessibility and offer an excellent customer service. UNIFY’s OpenScape Business solution makes all this and more possible. We congratulate everyone involved on the success of OpenScape Business.